After graduating from Mills College where she won the Flora Boyd Memorial award for piano performance, Minnesotan Jane Hastay immersed herself in the San Francisco music scene. She toured Europe with Lilith Theater Company, danced with Brazilian samba troupe Escola Nova de Samba, played in the American Hawaii Cruise Lines Orchestra, accompanied Concord recording artist Denise Perrier, and had a long-standing engagement leading a trio at the Fairmont Hotel. She earned her masters degree from Manhattan School of Music, toured Japan with the Kit McClure Big Band, and played at The Blue Note, The Lenox Lounge, The Five Spot, Kitano Hotel, St. Peter’s Church, New Haven Jazz Festival. Choral performance/conducting/teaching credits: Yamaha Music School, Fontbonne Hall Academy, The Ross School, Southampton Players, The Canby Singers, Choral Society of the Hamptons. 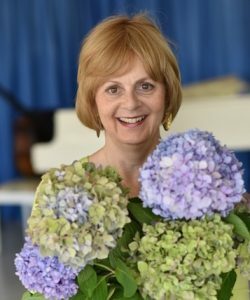 Jane is currently the organist, chancel choir and handbell conductor at the historic First Presbyterian Church of East Hampton. She has produced many concerts including an International Women in Jazz-sponsored performance at Saint Peter’s Church in NYC, featuring Etta Jones. Jane’s years of teaching the Yamaha Music Education Method, middle and high school chorus inspire her passion for producing engaging, diverse concerts for music lovers of all ages.